Other than the four main seasons (spring, summer, autumn, and winter), there are some in-between seasons that people rarely talk about. The weather during such times can be challenging to tell, but one thing is for sure, it is often wet. It can be grey, damp pre-winter, muddy, chill post-autumn, or slushy, melty pre-spring. You are left wondering what to wear, and as such we recommend you get waterproof boots. Whether you are hiking, working or running errands, you want to keep your feet warm. Nothing is as uncomfortable as having to work in wet socks as drenched boots. It can also lead to illnesses such as trench foot, and colds, and though they are curable, prevention is better. However, other than keeping your feet dry, here are some more reasons why you should get waterproof footwear. Grip and traction – Snow, water and ice lead to slippery conditions. They create an environment where you can slip fall and sustain a grave injury. This is even worse in a disastrous situation where you aren’t paying attention to where you are stepping. Standard footwear isn’t designed to handle such conditions. Waterproof work boots, on the other hand, have rubber soles with a firm grip for slip resistance, traction, and added grip. Therefore, you can do more without having to worry about where you are stepping. Debris – Flood water contains lots of hazards that can injure you. Strong winds and water carry waste, and you are not in a position to identify all threats beneath the water. Waterproof footwear, on the other hand, protects you from such dangers. Cleanliness and hygiene – Debris isn’t the only risk hidden under floodwater. Floodwater also happens to be dirty, and you will be walking through significant amounts of contaminants from animal waste to toxic substances, pesticides, raw sewage, chemicals, etc. According to the EPA (Environmental Protection Agency), polluted floodwater is responsible for myriads of illnesses from flu symptoms to intestinal problems. To avoid this, we recommend you get waterproof boots to protect you from skin contact. Resistance to chemicals – In the event of disastrous weather, you have to worry about more than contaminants and debris. Chemicals, solvents, and fuels that hadn’t been stored properly find their way into floodwater and can do quite some harm to your feet and health. Though waterproof footwear will not protect you from all chemicals, it offers a certain level of resistance. Antistatic and shock protection – Disastrous weather results in downed power lines, and although you are advised not to work near one, there are instances where you have to. You are encouraged to shuffle your feet when near downed power lines but waterproof boots offer a second layer of protection as they are antistatic. Seeing as waterproof boots are pricey, there are instances where individuals result to waterproofing their shoes. Below are some reasons why you should only consider waterproof footwear over waterproofing your boot. They are made by professionals and are bound to keep you dry. Some companies even offer a 30-day money back guarantee to assure you that indeed you are getting a waterproof boot. Unlike waterproofing your work boots which can result in them being uncomfortable, waterproof boots are made with coziness in mind. Seeing as it is “completely closed,” the inside of the boot is made with soft material that is breathable and comfortable. Also, some are made of insulating material, and thus you can use them in frigid conditions. The PRO 47001 will cradle and cushion your feet all day long from top to bottom. It is not only designed to be waterproof, but will also provide slip resistance, and abrasion resistance. It is polyurethane, and thus it can handle some abuse without sustaining any wear and tear. However, our top features are the comfort the shoe provides and the Goodyear welt cast-bond technology. Goodyear welt cast-bond technology - This tech creates a robust chemical bond between the uppers and soles of this shoe. It also happens to be repairable, and thus you need not worry in case the footwear sustains some damage. Also, it creates a broad platform for you to stand on which results in better stability. 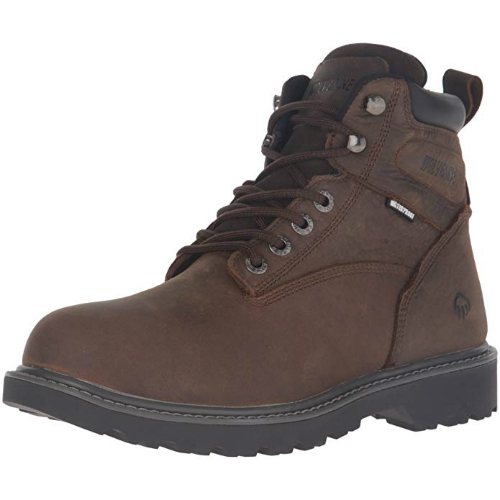 The tech uses Timberland PRO Titan last which results in a better fit and long-lasting footwear. Comfort – The PRO 47001 is designed with comfort in mind. It will allow you to work for extended hours without fatigue. First, it features an anatomically contoured inner sole that takes the shape of your feet. Furthermore, the pair features a steel shank which supports the arches, and enable flexible mobility. The Outlast adaptive comfort footbed cover regulates the temperature by wicking temperature away from your skin, and the contoured tongue features a center-loaded foam package to relieve lace pressure. The Timberland PRO 47001 Power Welt is a men’s boot. It can be used to work in wet conditions but will also do well where there is an electrical hazard. Also, if you are on your feet for extended periods, you will appreciate this pair. 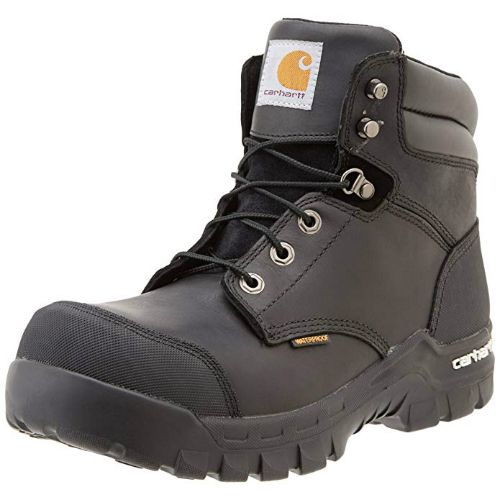 The Carhartt CMF6371 will keep your feet comfortable during any strenuous activities thanks to the rugged flex tech (more on this later). First, the shoe has a 6-inch height that increases the coverage and thus provides better protection from floodwater. It covers both your feet and ankles. You will also appreciate the cement construction as it creates a robust bond between the uppers and the Carhartt outsoles. Furthermore, you can use this around any open circuits thanks to the Electric Hazard rating, and the composite toe cups will protect your toes from harsh impacts or compressions from any falling or rolling objects. Nonetheless, our best features happen to be the rugged flex tech and the storm defender water protection. Rugged flex technology – The CMF6371 is designed in such a way that it moves and stretches along with you. This flexibility removes the strain from your feet allowing you to work longer and not suffer from achy feet at the end of the day. The ortholite insole also helps reduce fatigue and odor by providing just the right amount of cushioning and comfort. Storm defender – One complaint with waterproof boots is that they lack breathability. This is understandable as they are designed to keep water out. However, the CMF6371 are made with comfort in mind and are thus breathable while still locking out wetness. Given the rugged flex technology and the electric hazard rating, we recommend the Carhartt CMF6371 for men in the electrical field. The composite toes will save your toes at work. Wolverine has been making work boots since the late 1800s which is even longer than Timberland. They are a trusted brand as they have consistently provided value, quality, and comfort and at a fraction of the price. And so, if you work in an industry where there is very low likelihood that your toes will be hurt, we would recommend the soft toe boot. You will appreciate the price, as it is affordable, and the moisture-wicking mesh lining that keeps your feet dry. Nonetheless, our best features were that it’s waterproof and comfortable. Waterproof – The Floorhand soft toe work boot is designed to keep your feet dry and the sole, leather build, and the height of the shoe all help. The shoe is 6 inches high from the arch and will guard your feet and ankles against wetness. The rubber sole is waterproof and provides traction protecting you from any grave injuries. The uppers are imported leather which is impermeable but also durable. 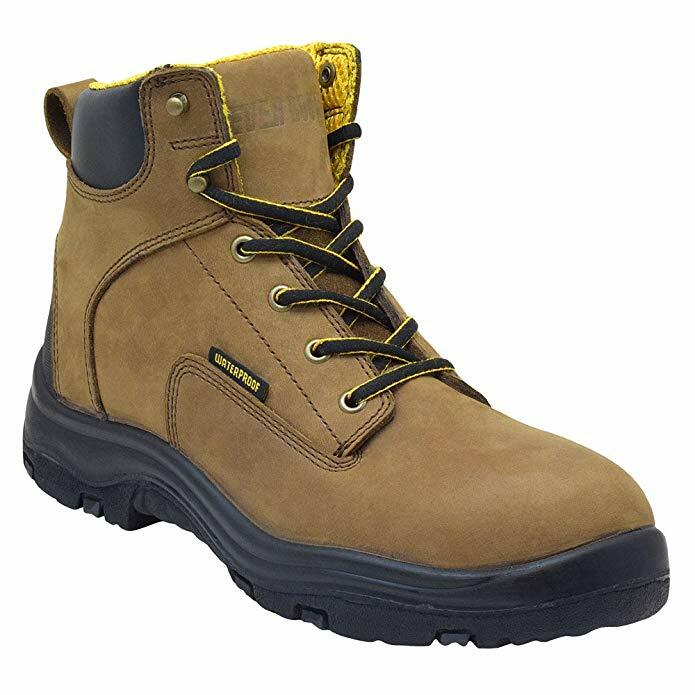 Comfortable – The tongue and collar of the Wolverine Floorhand boot are padded which increases the comfort of the shoes. The moisture-wicking inner lining also increases the coziness of the footwear, as does the cushioned footbed. The Wolverine Floorhand is for men working in relatively safe environments. We wouldn't recommend it for individuals in industries where items might fall or roll over their toes. 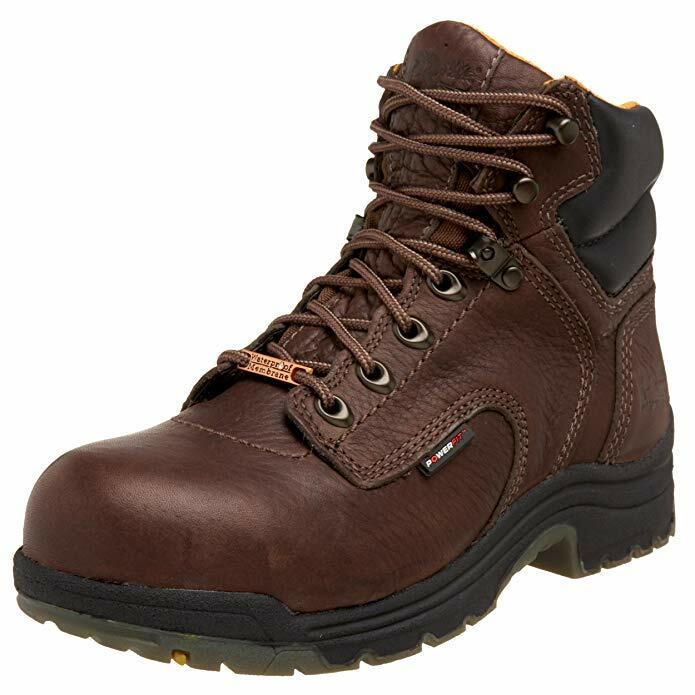 If you are in the market for a pair of affordable work boots, one that is comfortable and provides support when you are working in unpredictable terrain, we recommend you get the Sketchers Relment. The boot is leather and is designed to keep wetness out. The sole is synthetic rubber and not only comfortable but has some solid grip thanks to the lug patterns. However, our best features were the comfort and how aesthetically pleasing the pair is. Aesthetics – The Sketchers Relment Pelma Chukka boots are designed to be easy on the eye. First, it uses neutral colors that will complement every outfit. It also happens to have a ruggedly chic look that is alluring and looks great in many different settings. Furthermore, the overlay accents and detailed stitching increases personality and makes them a bit edgier. Comfort – The Sketchers is the best shoe to use in rugged terrain, and the Men’s Relment is the pinnacle of comfort and protection. The sizing is one of the company’s unique selling points, and the shoes fit perfectly. They are neither too big neither are they too small. They are ergonomically designed and will wrap around your feet. Moreover, the insole has a memory foam padding for a relaxed feel when stepping on any hard object. The padded collar and gusseted tongue prevent debris from getting into the shoe, while the soft inner lining gently rubs against your feet. 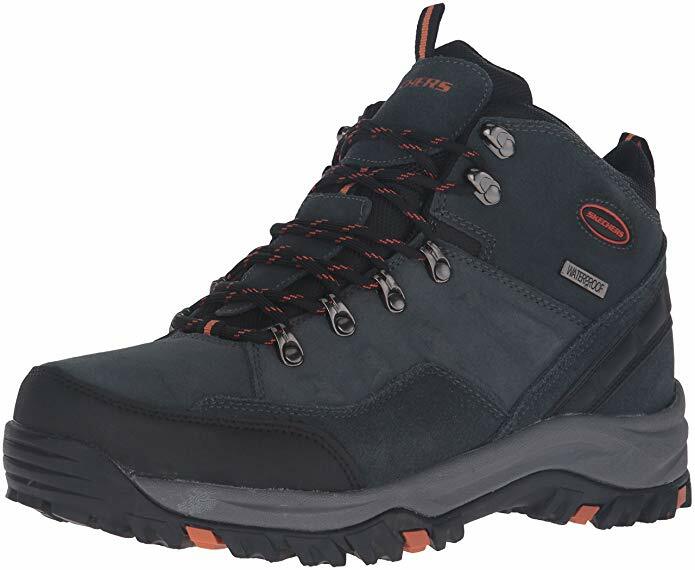 If you are involved in a lot of fieldwork in the rough, or some unpredictable terrain, we recommend you get the Pelma Chukka for the comfort and support. Timberland has been making boots since 1952 and has delivered consistent quality, robustness, and value for more than half a century. The TiTANs waterproof boots are perfect for ladies and will help you brave extreme weather without having to worry about wet feet or slipping. They are made of waterproof leather uppers and rubber outsoles which are not only waterproof but are water and oil resistant. Furthermore, the outsole is reinforced by a high traction-lug pattern. They are also designed to be fast, and easy to lace up. Thanks to the fish-eye hooks, the chore of tying is effortless. The laces too happen to be quite sturdy and will serve you for a while. Our best features though were the mid-high shaft and the insole. Mid-high shaft – Individual working in uncertain terrain know the difference a comfortable shoe with superb support can make. The TiTANs boot features a shaft that gets above the ankle upfront increasing the support but is about half an inch lower on the back enhancing the comfort when moving. Insole – For extra cushioning when working in rough areas, the insole features some inserts that also increase the support. These are for mid-high work. You can also use it around open circuits thanks to the electric hazard rating. Caterpillar is renowned for making quality items, and the CAT logo is associated with quality and heavy-duty durability. You can expect the Men’s 2nd Shift boot to serve you for about six months under heavy use, and 12 months if you use it for light tasks. First, you will appreciate the rugged features and undeniable stylishness. It also uses neutral colors, and thus you can don it with any attire. It also happens to be affordable, and you will be getting a premium product. The leather upper and rubber sole will keep your feet dry and happy for more extended periods. The outsole also happens to be oil and water resistant, and thus you don’t have to worry about sustaining grave injuries in case of a fall. The shock and impact absorbers too increase the appeal of this product. 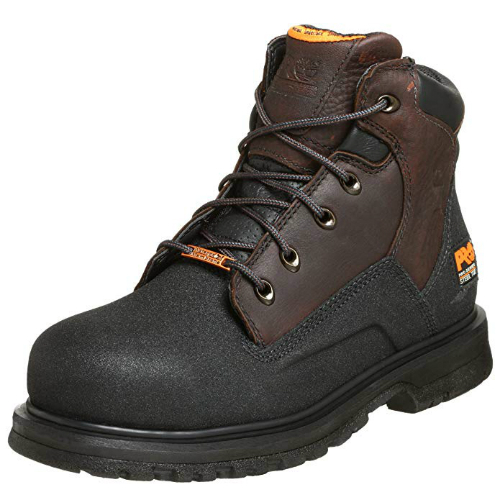 Comfort – When working during the colder season, you need a boot that will keep your feet warm. The 2nd Shift has a Thinsulate insulation feature that will keep your feet smiling. It also has a soft inner sole that contours with your feet for max comfort. Finally, the removable EVA foam insert with gel technology adds to the luxury. Steel toe cap – If you are in the construction industry or somewhere you run the risk of something falling or rolling over your toes, you will appreciate the protection the steel toe cap provides. It also keeps shoes in top shape. 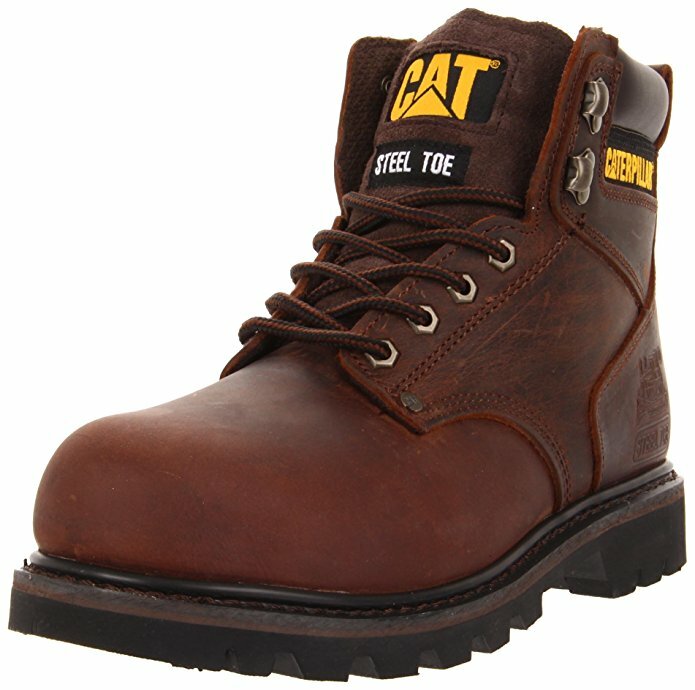 The Caterpillar 2nd Shift boot is for working in light rain. It cannot be used in heavy rain or snow as water seeps through the tongue. If you are in the market for affordable but quality shoes, we recommend you get the Everboots “Ultra Dry.” First, these feature a waterproof sealed-direct attach construction that creates a super waterproof proof bond on the uppers. The membrane is impermeable to any liquids but still allows moisture to escape. The boots also happen to be fast and easy to lace up thanks to the hook grommets. However, our best features were how affordable these are, and the comfort they provide. Affordable – Most people shun low-cost boots as they have the notion that they are not solid items. Though that is true, it isn’t the case with these Everboots. They are made of durable material, and they are robust at an affordable price. It is less than half the amount of other shoes on this list. Furthermore, there is a 30-day waterproof money back guarantee should the boot allow water in. Comfortable – First, the midsole is polyurethane and acts as a shock absorber saving you from fatigue. It’s also lightweight and thus ideal for use for extended periods of time. Finally, there are flex points that increase movement when compared to other options. The Everboot “Ultra Dry” can be used by individuals in the construction industry, for hiking, or gardening. 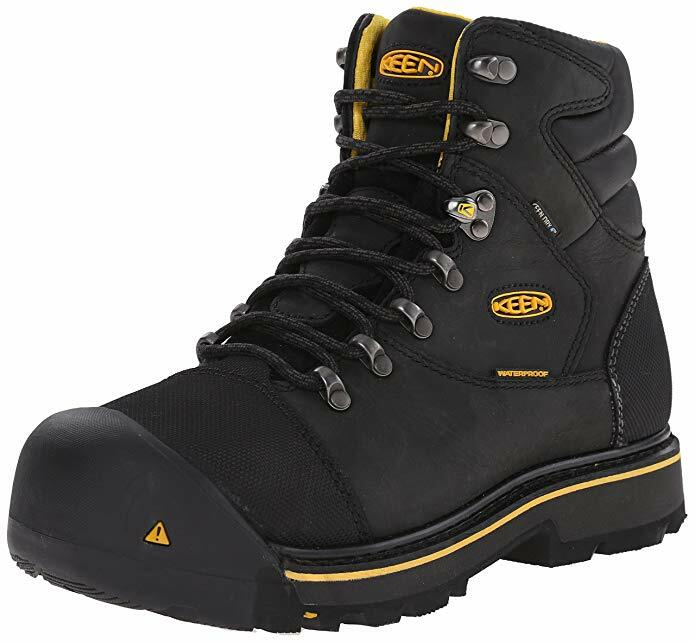 If you are looking for the most comfortable waterproof boot in the market, we recommend you get the Keen Milwaukee boots. They are 6-inch high and will keep you safe in mid-high work. They are available in black or rugged brown and can be used for any task other than meeting the bankers. First, you will appreciate the membrane as it is not only waterproof but also keeps your feet cool and dry. The outsole was especially impressive as it is slip-resistant, non-marking and resistant to water and oil. You are therefore safe in any slippery situation. Nonetheless, the best features were the comfort and protection. Protection - Very few boots have taken safety as seriously as the Keen Milwaukee. It not only features a steel toe cap but also has a sturdy, abrasion resistant material that is generously wrapped around the heel that protects your heels. Furthermore, the soles are puncture resistant to ASTM requirements. Comfort – The Milwaukee boots are the most comfortable of the boots on this list. First, they require little to no break in time, and they are ready to use out the box. They also feature a patented TPU shank which increases the stability and support when working. Moreover, the shoes are roomy, and you can wiggle your toes thus negating the discomfort associated with most steel toe caps. Finally, there is the dual-density footbed that is soft and negates the need for socks as it increases coziness. The Keen Utility Milwaukee boot is for people who need the extra comfort. If you are on your feet for long periods of time, we recommend you get a pair. If you are on a rather generous budget, we recommend you get the Chippewa 29416. First, these boots are 8-inches high and will keep water and snow out of your shoes. They are for working in heavy rain or deep snow. You will also appreciate the Bay Apache waterproof uppers as they are quite durable and will keep wetness out. For durability, there is also the Goodyear leather welt construction that attaches the uppers to the sole. It happens to be stitched and not glued and thus is more durable and easy to repair. The laces to are heavy-duty and sta-tied which increases the durability for those rugged conditions. You will also appreciate the Vibram cascade yellow plug outsoles as they are best for sure footing. They are oil and slip resistant. Comfort – They Chippewa 29416 are designed with comfort in mind. They have a soft and comfortable inside, and a sweat control fiber that will wick perspiration away keeping you warm. The triple ribbed steel shank helps with arch support increasing the control and stability. Finally, there is the texon 460-orthotic inside cushion which softens every step you take increasing the comfort. Insulation – When working in snow or extreme weather, you are looking for a pair of shows that not only keeps you dry but warm too. 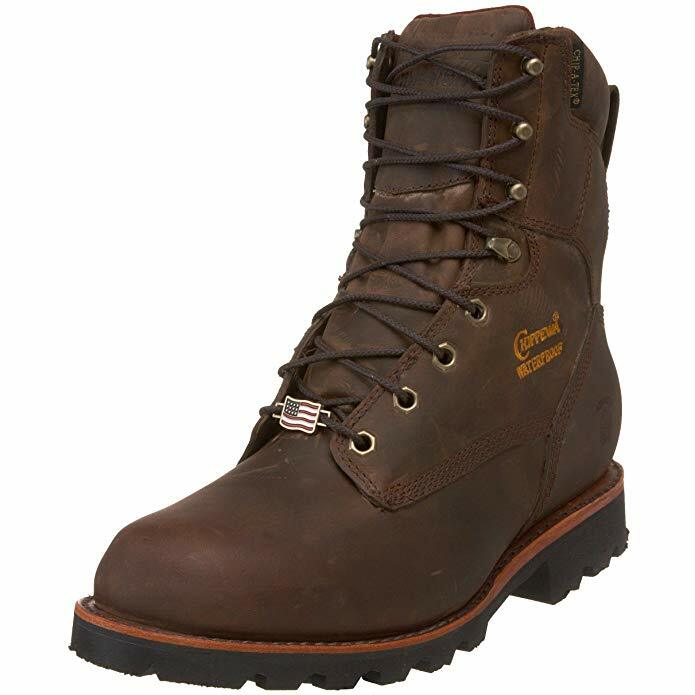 The Chippewa 29416 features a 400g Thinsulate feature that is lighter than most materials. It keeps you warm without the bulk. The Chippewa 29416 is for people looking for high-insulated boots and are on a generous budget. The Detroit Mid Steel boot is perfect for hardworking ladies. 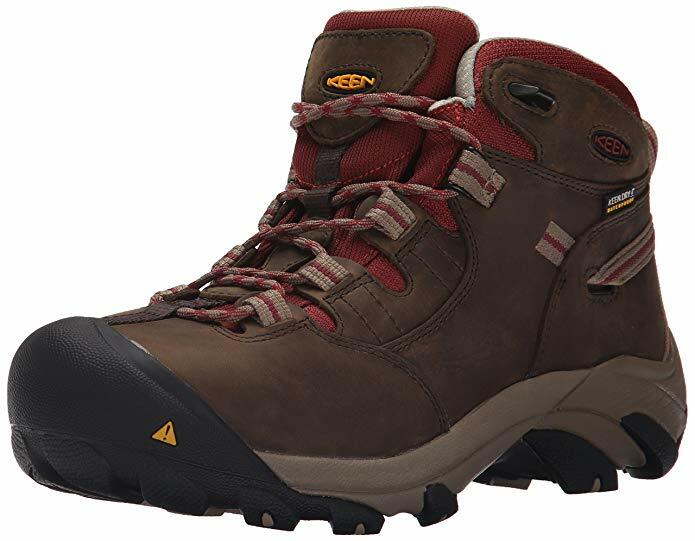 It is a hiking work boot combination and one of the best products on the market. Thanks to the KEEN.Dry membrane they will keep wetness out but will allow air in and out of the boot to keep you cool. It has excellent traction and is oil and slip resistant. Therefore, it protects you from any dangerous falls. The sole to happens to be ASTM rated for electrical hazard protection, and thus you can use it around any open circuits. Since these are hiking boots that are for use in the workplace, you can use them for extended periods of time without fatigue. They give a snug fit and spacious toe caps. There are more features increasing comfort. Thus it happens to be our top feature alongside asymmetrical steel toes. Asymmetrical steel toes – These are designed to flow with your left and right foot and will protect the large toe to the little one. They are also designed to be breathable which increases the comfort thanks to the wiggle room. Comfort – Everything about this boot is designed to increase the comfort. At slightly over 2 pounds, it is lightweight and can be used for long work hours with little fatigue. The mesh interior makes the boot breathable and quite comfortable to wear. Moreover, there is the nubuck leather which is soft to the touch and durable like full-grain leather. It is pliant and stretchy and will move with each of your steps. It is for mid-high work or light showers as it is a low-cut boot. But what should you look for in waterproof footwear? The first thing you should know is that the cost isn’t directly proportional to the quality. That is, expensive shoes aren’t better than cheaper options. The marketing budget, the place where the shoes are manufactured, and the brand determine the final cost. There is no one size fits all waterproof work boot. Some are made for hiking, some for driving, walking long distances, working, and even standing still. Ensure you get a pair that is designed for your purpose. First, waterproof boots are quite pricey. Therefore, you want the best value for your money. Ensure it can withstand some abuse with minimal wear and tear. How do I maintain my waterproof boots? WThese type of boots lose their water repellent nature after excessive use. Therefore, it is recommended that you reproof the shoes regularly and also maintain them to retain their appeal. However, reproofing and preserving the boots largely depends on the material. If you have Timberland boots, we recommend you use a pencil eraser or Timberland cleaning bar to get rid of scuffs. Rub the eraser or cleaning bar over any marks until they disappear. This should take care of most day to day marks. For reproofing, you need first to identify the material of the shoe. If it’s full-grain leather, it is known to crack as the moisture, and natural oils are lost. To retain the waterproof properties, use dubbin wax and rub over the material after a thorough cleaning. Repeat if necessary and leave to dry for thirty to sixty minutes then buff the wax off. When dealing with suede or nubuck leather, first clean the boots and then use a reproofing spray. Spray from a distance of about 5 cm and ensure you get even coverage. Dry them naturally and then use a footwear brush to restore them to their original look. As for waterproof fabric shoes, they are a bit difficult to clean as they collect dirt particles. They need to be cleaned regularly lest these dirt particles cause the fibers to decay reducing the lifespan of the boots. They can be reproofed while wet or dry by applying a spray on proofer. Are water resistant boots the same as waterproof boots? The short answer is no they aren’t. Water resistant boots can keep water out to a certain extent, but they will finally seep. They are not 100% waterproof. How does climate affect the pair I should purchase? Though they are designed for the same purpose, to keep water out, waterproof boots for winter will not be the same as those you use during summer. If you reside in an area where you receive extreme winters, we recommend you purchase insulated boots (there are a few on this list), or footwear that has enough space for you to add insulation. The latter is also best if you reside in areas with cold winters and sweltering summers. On the other hand, if you reside in areas that are hot and humid, you are looking for boots that are void of insulation and breathable. You can get waterproof boots for any industry or weather in any design and at any cost. However, you should always ensure that you are getting top value for your money. Don’t let the price tag fool you as some of these shoes are only pricey owing to the brand and marketing. The boots on this list offer the best value, and the companies behind them are renowned for their consistent quality and durability. We would recommend you get one of these if you are looking for recommendations. Finally, if you feel there is something we missed, let us know in the comments below.